Dev Vilas is one of the most luxurious and famous resorts in Ranthambore that is loved by vacationers for high level of hospitality, superior services and contemporary facilities. Located near the main attraction of the city, Ranthambore National Park, Dev Vilas resort offers comfort and ease to its customers during their tour to tiger reserve. As this resort lies in the proximity to the national park, guests can have exclusive sights of wildlife in their natural habitat from their room or resort. So, living in Dev Vilas gives a great amount of pleasure and satisfaction to the vacationers. Dev Vilas resort gives utmost priority to the customer satisfaction and for this reason, they offer the best hospitality to the guests during their stay here. The services are prompt and fully professional. Having such warm services adds pleasure to the trip of the guests. The appealing surroundings and sprawling green gardens around the resort keeps guests rejuvenated all the time. The accommodation options in Dev Vilas are categorised in tented bungalows, deluxe rooms and suites. There are total 19 beautiful deluxe room in which 14 are double rooms and 5 are twin rooms, 2 aesthetically designed suites and 7 attractively designed tented bungalows that feature amazing facilities for providing high comfort level to the guests. Each room is spacious and is furnished with artistic furniture for comfortable stay. The best element of these rooms is; you won’t find similarity in rooms as each room is designed with unique concept to complement the exterior beauty. For featuring relaxed stay, the room comes with a range of facilities like telephone, attached bath, AC rooms, king/queen sized beds, mini-bar, cold and hot water supply and much more. A big window is there to provide you a picturesque outdoor scenery of natural beauty and Aravali ranges. A well-decorated big dining area is there which is called Aududon Room in Dev Vilas where guests are served with mouth-watering dishes on table. The entire dining hall is decorated with exclusive lithographs made by John James Audubon who is a famous French painter and the name of this dining hall is taken from him only. In this resort, customers are provided with the finest quality of continental and Indian cuisines. To enjoy food around swimming pool, there is Al Fresco that serve mouth-watering dishes to the guests. 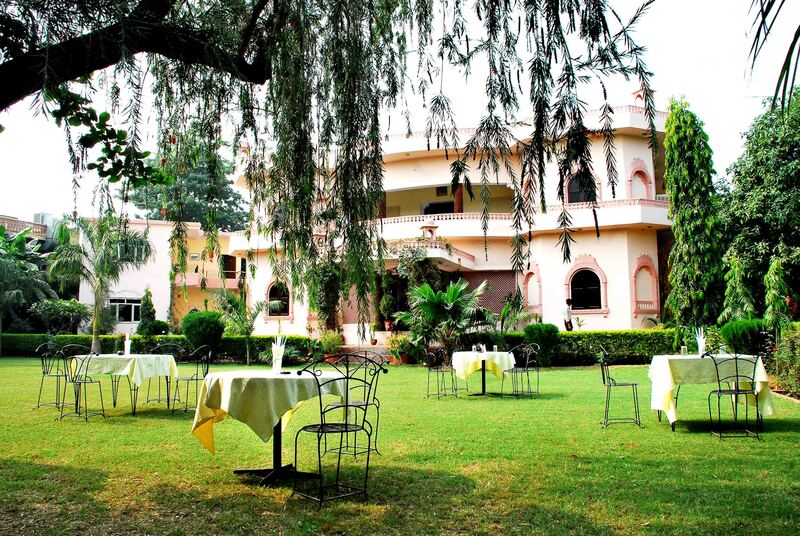 This great resort in Ranthambore offers almost all modern facility that one needs for a comfortable stay during a tour. The list of facilities include wheel chair, parking lot, conference room, doctor on call, sunset terrace, room service, swimming pool, forex, jeep safari, business centre, laundry, dry cleaning service, internet access, mini bar available in rooms, STD and ISD telephone facility, travel desk and safe deposit lockers.